The Okanagan is one of the most sought-after tourist destinations in North America, and with spots like these, it's easy to see why. With an extensive system of E.V. charging stations AND Tesla destination chargers, the Okanagan is an easy destination of choice for Tesla owners. Every hotel and resort listed below boasts a Tesla destination charger and it's own unique style. From luxury resorts, to charming boutique hotels... there is something for everyone. Sunset over Vernon, BC in the Okanagan Valley -- a perfect destination for Tesla owners. Treat yourself to a luxurious stay at this world-renowned resort & spa. Enjoy breathtaking views of Lake Okanagan and the mountains from your soaker tub with a glass of champagne! Take advantage of their KurSpa treatments, then relax with one of their famous saunas. Located right next to Predator Ridge Resort and only a 35-minute drive to Kelowna. This resort gives you the 5-star experience in the heart of the Okanagan. (NOTE: make sure to try out their signature Cryo Cold Chamber at -110c). Predator Ridge is a thriving year-round community, offering unparalleled amenities and two of Canada’s finest golf courses – all located in one beautiful community, about 15kms south of Vernon BC. 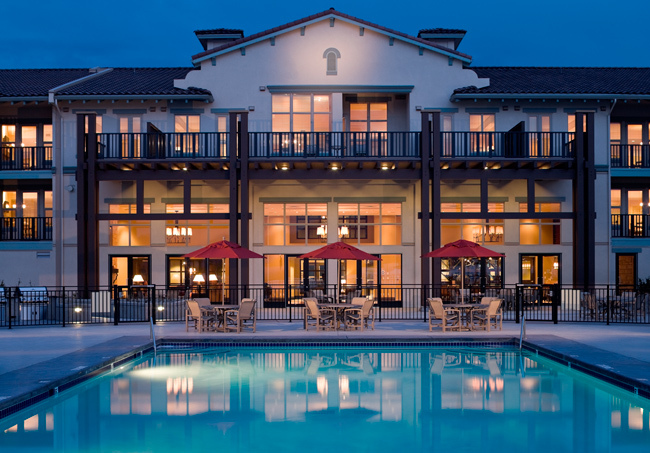 Enjoy fine dining, biking trails, outdoor yoga platforms, pet-friendly amenities and more. Nestled on the ridge between Kalamalka Lake and Okanagan Lake, this Tesla-friendly destination will not disappoint. Set right in the heart of Kelowna this resort is in prime location for everything the Okanagan has to offer. Located on Lake Okanagan right next to downtown Kelowna, it is within 25 minutes of world class wineries and golf courses. The resort offers spa treatments, saunas, fitness center, multiple pools and its own casino for a night of fun! Spend the day walking on the boardwalk or checking all the boutiques downtown. This resort is a great option if you are travelling with kids or pets but still want the comfort. Crooked Tree is an incredibly charming stay. This spot is mere minutes from the Naramata Bench; the infamous home to over 20 award-winning wineries. The Guest Suites offer amazing views of the mountains and Okanagan Lake; grab an award-winning bottle of wine and enjoy it slowly on the patio! Nestled in the trees, you'll enjoy a quiet and cozy stay. Crooked Tree is still close to amenities and - more importantly – local wineries. Not to mention, they're one of the highest rated in Penticton! Summerland Waterfront Resort & Spa is in center of Okanagan wine country, making it ideal for touring to the different wineries. The resort is within 45 minutes from Kelowna and only a 17-minute drive to Penticton. The resort offers modern rooms with a full kitchen, soaker tub and lots of space. Spend the day in the pool, lounging in the sun, and end your day gazing at the stars over the lake from one of their outdoor hot tubs. Located right next to Oliver (The wine capital of Canada), this resort is the ultimate wine-lovers destination! Walnut Beach Resort offers a private beach on Osoyoos Lake and boasts a beautiful outdoor pool with a serious view. Enjoy the resort's BBQ area, spend the day kayaking on the lake or take advantage of the OK Wine Shuttle. The shuttle will pick you up from this resort and take you to designated wine spots for up to 6 hours... reasonably priced at $85 dollars per person. This Resort is the idyllic spot for wine lovers since it is a part of Nk’Mip Cellars and in the heart of wine country. Spend the day strolling through the vineyards and take up a tasting of international award-winning wine at the first Aboriginal owned winery in North America. The Resort offers multiple places to eat including The Patio at Nk’Mip Cellars which uses traditional aboriginal culinary techniques for their mouthwatering cuisine.